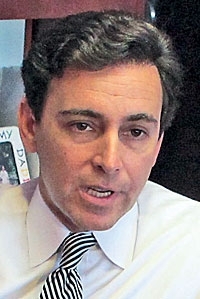 After rising quickly through Ford's executive ranks, Mark Fields has been the company's president of the Americas for seven years, during which time he has become more relaxed and self-assured. Fields has had time to ponder the lessons learned by staying put for so long. He says he has gained insights over the last seven years. One: "Be comfortable in my own skin." Fields is eager to portray himself as a team player and consensus builder. He says he has learned to be a better listener. "I subscribe to the school of asking questions and listening and not talking. That way you draw out the best of people to kind of understand their points of view," he says. "My most important role [is] really bringing out the best strengths in my management team so they can bring those strengths to bear on the business. The business can benefit from that, and they can develop as well as people and as business persons." "We work very well together because, I think, we respect each other as business people but also we respect each other as individuals," he says. "Everybody's not like you or should be like you, but you've got to fit those pieces of the puzzle together." When asked how he feels about the board's decision to let Mulally stay indefinitely, Fields brushes the question aside: "Listen, I think Alan is providing great leadership for the company. My ambition is to contribute as most as I can to the profitable growth of Ford. That means continuing to lead the Americas and make our contribution to the company, and I'm very happy with that."